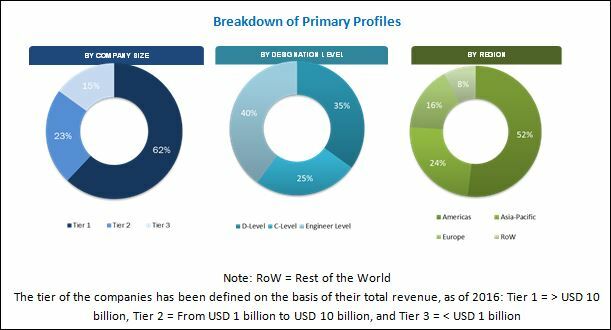 [137 Pages Report] The global smart meters market is valued at USD 12.79 Billion in 2017, and is expected to grow at a CAGR of 9.34% from 2017 to 2022. This research study involved the use of extensive secondary sources, directories, journals on advanced metering infrastructure, automatic meter reading, energy storage, and other related equipment market; newsletters and databases such as Hoovers, Bloomberg, Businessweek, Factiva, among others to identify and collect information useful for a technical, market-oriented, and commercial study of the global smart meters market. Primary sources are mainly several industry experts from core and related industries, vendors, preferred suppliers, technology developers, alliances, and organizations related to all the segments of this industry’s value chain. The points given below explain the research methodology. The smart meters ecosystem comprises of power and automation technology companies such as Itron, Inc. (U.S.), Kamstrup A/S (Denmark), Holley Metering, Ltd. (China), Honeywell International, Inc. (U.S.), and Toshiba Corporation (Japan), among others. The global smart meters market is projected to grow at a CAGR of 9.34% from 2017 to 2022, to reach a market size of USD 19.98 Billion by 2022. This growth can be attributed to the rising investments in smart grid projects and increasing upgradation of transmission & distribution infrastructure, government policies, and energy conservation. The report segments the smart meters market on the basis of technology such as Advanced Metering Infrastructure (AMI), and Automatic Meter Reading (AMR). The AMI are expected to constitute the fastest growing market from 2017 to 2022 because AMI reduces labour cost and several power, water, & gas utilities worldwide are replacing AMR with AMI infrastructure, further creating growth opportunities for the AMI market. The U.S. is the largest market for AMI. The report segments the smart meters market based on application segment such as commercial, industrial, and residential. The residential segment is expected to grow at the fastest rate during the forecast period. Globally, residential application accounted for approximately 84% of the smart meter installations. The demand for smart meters in the residential sector is driven by factors such as a surge in demand for central systems and smart end-users (such as nanotechnologies, energy efficient lighting, electric heat pump, and home control network) appliances. 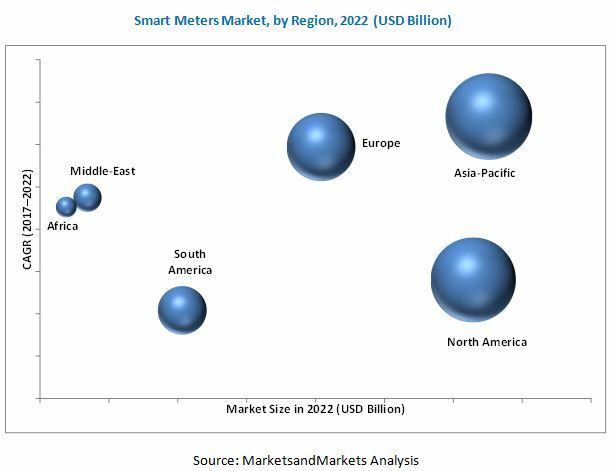 In this report, the smart meters market has been analyzed with respect to six regions, namely, North America, Europe, Asia-Pacific, South America, Middle East, and Africa. Asia-Pacific is expected to dominate the global smart meters market during the forecast period, owing to the extensive use of these solutions in the commercial, residential, as well as industrial sector. The Asia-Pacific market is projected to grow at the highest CAGR from 2017 to 2022. The region is the largest market for the infrastructure sector and industrial sector and is taking various steps such as investments in smart grid, smart city & the gas pipeline networks, repair & upgradation of aging infrastructure, preventing electric, water, & gas theft, minimizing inaccurate metering & managing growing electricity, and water scarcity. High installation costs for end-users could be a restraint of the smart meters market which might lead to decline in profit. Additionally, Radio Frequency (RF) emissions from smart meters are within the U.S. Federal Communications Commission (FCC) limits. However, some campaign groups (such as Stop Smart Meters U.K.) in both the U.K. and the U.S. believe smart meters to be an unnecessary health and security risks. Hence, these uncertainties with respect to smart meters would hinder the smart meters market growth. Leading players in the smart meters market include Itron, Inc. (U.S.), Kamstrup A/S (Denmark), Holley Metering, Ltd. (China), Honeywell International, Inc. (U.S.), and Toshiba Corporation (Japan). Contracts and agreements was the most commonly adopted strategy by the top players. It was followed by new product developments, expansions and investments, and mergers & acquisitions. *Top 25 Companies Analyzed for This Study Are- Aclara Technologies LLC., Microchip Technology Inc., EDMI Ltd., Holley Metering Ltd., Honeywell International Inc., Itron Inc., Schneider Electric, Siemens Ag, Toshiba Corporation (Landis+GYR), Wasion Group, Sensus, Badger Meter Inc., Kamstrup A/S, ICSA (India) Limited, Iskraemeco, Jiangsu Linyang Electronics Co., Ltd., Circutor, Networked Energy Service Corp., Neptune Technology Group, Genus Power Infrastructures Ltd, Master Meters, Diehl Metering GmbH, Sentec Ltd., B. Meters, Chongqing Smart Water Meter Group Co., Ltd.
11.13 Jiangsu Linyang Energy Co.